3,4 - 3,4,5..........Bingo von Ellendonk. 3 - 3,4,5.............Cona von Niederkassel. 4,5 - 4,5.............Palma von Ellendonk. 4,5 - 4,5.............Jago von Beelen. 4,5 - 4,5.............Satan von Ellendonk. 2002: 85-82-95 = 262 points (21st). 2001: 93-88-90 = 271 points (9th). 2000: 96-85-82 = 263 points (19th). 2002: 92-90-96 = 278 points (5th). 2001: 99-75-97 = 271 points (5th). 2000: 97-90-87 = 274 points. 28/08/1999: 88-81-100 = 269 points. 29/11/1997: 97-87-86 = 270 points. 31/10/2001: 100-88-96 = 284 points (1st). 26/08/2001: 99-75-97 = 271 points. 07/04/2001: 98-96-88 = 282 points. 21/10/2000: 97-87-85 = 270 points. 08/04/2000: 90-91-96 = 277 points. 27/08/2000: 97-90-87 = 274 points. 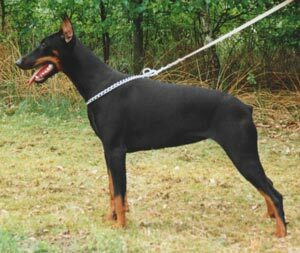 Brista von der Doberwache competed in the D.V. Meisterschaft and passed the Körung with highest rating for hardness and working drives (very high protection, fighting spirit, courage and hardness with middle sharpness). Brista's dam, Kleo von der Weyermühle, was a German Police dog who also won the working IDC World Championship in 1996 and her sire, Gero von der Mooreiche, was runner-up at the D.V. Meisterschaft in 1992 and 1996. Brista lived to 11½ years of age while her sire lived to 12 years of age and her dam lived to almost 13 years of age. Bingo: Police protection, drug and explosives search dog. Bastian: Police protection, drug and explosives search dog. Bronco: SchH 3, FH 2, Westfalen FH Tracking Champion and DV-DM participant. He is sire of the vom Blitzkrieger “F, H” litters (Faroh, Hagan, Hakim); Briska's “S, T, X” litters (Senta, Sumo, Tessie); Torres “A” litter (Argos); and Ascomannis “G, H, J” litters (Gina, Gitano). Branca: SchH 3 and passed the Körung with highest rating for hardness and working drives. She is dam of the von der Drachenburg “A” litter (Aissil, Amica). Biene: IPO 2 and passed the Swedish Körung. She is dam of Briska's “Q, W” litters (Qampus, Queenie, Wilma, Winnie). Bonny: SchH 2 and passed the ZTP with 1A rating for character and G for conformation. She is dam of the von der Weyermühle “T” litter (Tyra). Chico: sire of the von der Burgstätte “E, F, G” litters (Ernst, Esta, Gilla); vom Ferrenberg “H” litter (Heartbreaker) and vom Burgwald “P, Q” litters. Aaron: IPO 3 and DV-DM participant in 2004. Addy: SchH 3 and passed the Körung with Körklasse 2A rating. He is sire of the vom Burghof “A, B” litters (Akascha, Aycka, Bosz, Brabus) and vom Elbenwald “A” litter (Ashley). Arno: IPO 3, DV-DM participant and passed the Körung 'for life' with Körklasse 2A rating. Asco: IPO 3, FH, DV-DM participant and passed the Körung 'for life' with highest rating for hardness and working drives with middle sharpness. He is sire of the vom Ferrenberg “I” litter (Ilk); vom Eschenbruch “K, L, O, P” litters (Kuba, Lucky) Briska's “A, Z” litters (Zarek) and vom Burgwald “R” litter (Rocco, Ringo, Ria). Baghira: IPO 3, FH and passed the ZTP with 1A rating for character and SG for conformation. She is dam of the vom Elbenwald “A” litter (Ashley). Brechi: IPO 3, IDC-WM participant and BDCB-Leistungssieger in 2005. Calle: IPO 3 and passed the ZTP with 1A for character and SG for conformation. He is sire of the von der Burgstätte “I” litter and vom Aurachgrund “O” litter (Orthos). Carla: IPO 3 and passed the ZTP with 1A for character and SG for conformation. She is dam of the von der Burgstätte “E, F, G” litters (Ernst, Ehnoa, Esta).